The 33rd Hugh M Fitzpatrick Lecture in Legal Bibliography, in association with the Confederal School of Religions, Peace Studies and Theology, Trinity College Dublin, is hosting a lecture delivered by John F. Larkin, QC, Attorney Generals for Northern Ireland. 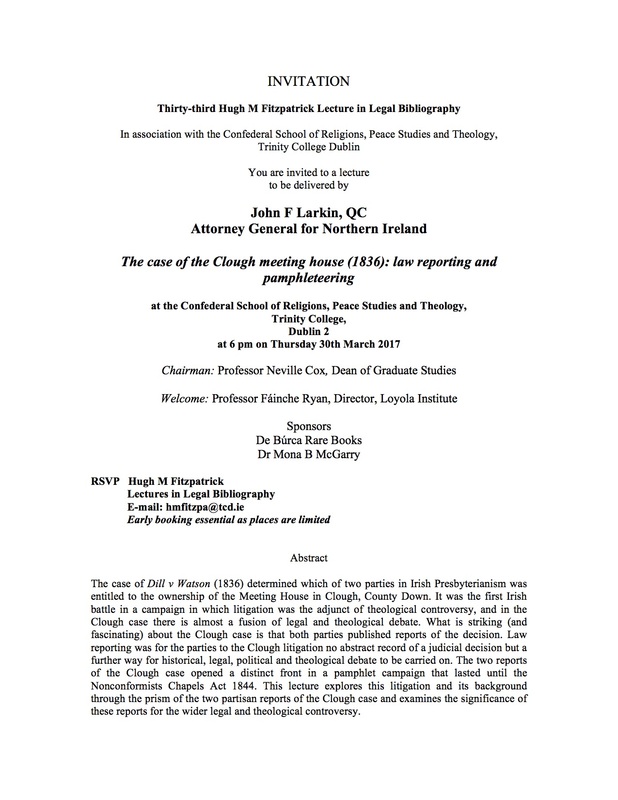 The paper is entitled ‘The Case of the CLogh meeting house (1836): law reporting and pamphleteering.’ It will be held at the Confederal School of Religions, Peace Studies and Theology at Trinity on 30 March 2017 at 6pm. The event is free and open to the public but booking is required. For further details see the flyer below.